While the 2018 wildfire season so far has been relatively tame by Alaska standards, there is still time for that to change. All you have to do is look at Alaska’s two biggest fire seasons – 2004 and 2015 – to come to that conclusion. The number of acres burned by wildfires in Alaska this summer passed the 100,000-acre mark on Tuesday, thanks mostly to several large fires burning unchecked in remote parts of the central and western Interior. 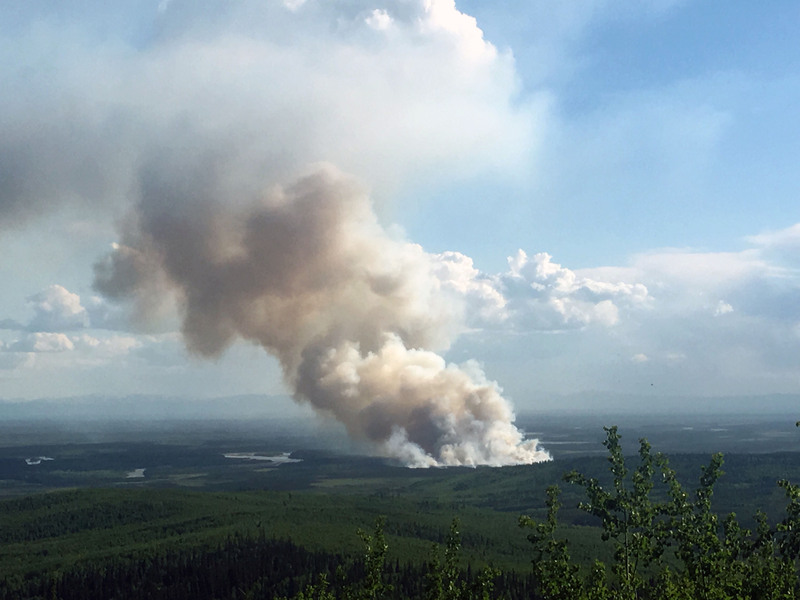 According to the Alaska Interagency Coordination Center’s daily situation report released Wednesday morning, there have been a total of 203 wildfires reported so far this season and they have burned an estimated 119,501 acres. Those numbers are practically identical to 2017, when 198 fires had burned an estimated 125,619 acres as of June 13. By the end of the season, 362 fires had been recorded and the burned acreage total stood at 653,148 acres, which is about half of what burns in a normal summer in Alaska. But a quick look back at 2004 and 2015 shows that we may not quite be out of the woods yet. In 2015, which ranks as the second-largest fire season on record with 768 fires that burned more than 5.1 million acres, there had been 241 fires reported and only an estimated 59,757 acres had burned as of June 13, half of what has burned so far this season. And in 2004, which ranks as the largest fire season on record with 696 fires and more than 6.5 million acres burned, the fire season was barely getting started at this point. As of June 13 that year, there had been only 182 fires reported and an estimated 22,630 acres burned. Of course, anyone who lived in Alaska in either one of those years knows what happened. Warm, dry conditions primed the landscape for wildfires in both 2004 and 2015 and things took off in mid-June. In 2004, for example, the number of reported fires jumped to 331 and the estimated burned acreage climbed to 1,153,535 by June 30. Ironically, the largest fire of the 2004 season, the 537,627-acre Boundary Fire north of Fairbanks, started on June 13. In 2015, the increase in fire activity in the last half of June was even more dramatic. That year, the number of fires jumped from 241 on June 13 to 617 by June 30 and the estimated burned acreage skyrocketed from 59,757 to 1,884,760 acres, thanks in large part to a lightning bust that saw 60,000 lightning strikes over the course of five days that produced 295 new fires. Nearly 4 million acres burned from mid-June to mid-July that year. This year’s weather situation is not all that different from 2004, when a warm, wet May and early June curtailed fire activity until things dried out in the last half of June and fires started popping up across the northern half of the state. This year, it was a cool, extended spring that kept the lid on wildfires until lightning storms in the first week of June resulted in nearly 100 new wildfire starts. While the weather has cooled considerably during the past week due to a cold front that passed through the eastern Interior and cooler, wetter weather is in the forecast through the weekend for a good chunk of the state, there is still plenty of time for fire season to roar to life. All it takes is a week of hot, dry weather to prime the pump and there is plenty of summer left for that to happen. So the moral of this story is that you can’t predict what will happen when it comes to wildfire season in Alaska. All you can do is prepare for the worst and hope for the best. In other words, don’t write the 2018 wildfire season off just yet. There’s still lots of summer left and we certainly are due for some hot, dry weather.